Sometimes, when he’s driving through South Texas, Rafael Ricardo “Rick” Ramirez feels his jaw clench and his grip tighten on the steering wheel. It happens when he’s spotted a pasture that hasn’t been tended to in years, left to bake in the sun. To a lifelong steward of the land like Rick, it’s a tragedy. Rick (B.S. ’79) and his wife, Carmen (B.A. 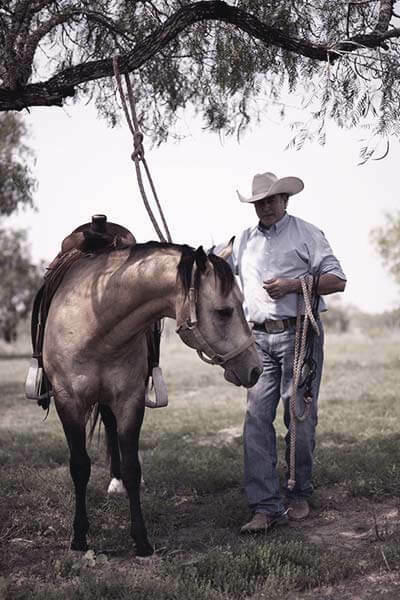 ’79), own and run Charco Redondo, an 1,800-acre cattle ranch near Hebbronville that has survived under the Ramirez name for six generations. 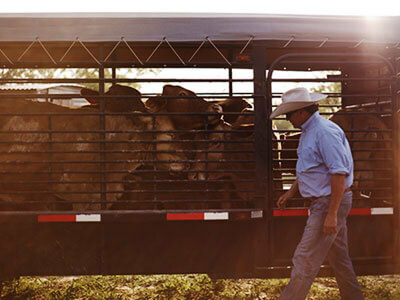 On it lie 450 acres of Kleingrass and legumes that are part of the Conservation Reserve Program; Beefmaster cattle, sporting the same Five Bar brand that Rick’s father, Horacio, registered 60 years ago; and a Quarter Horse breeding operation. Everything Rick and Carmen own today has been paid for with decades of grueling work and tears. So when he sees neglected land, it’s personal. And the work is far from over. During rare moments of leisure, Rick navigates his way on horseback through a dry tangle of thickets to a spring-fed watering hole. It’s one of his favorite places on the ranch, and after abundant rainfall, wildlife tracks read like a roadmap to the pool. The problem is that the rain is scarce. Since 2010, a relentless drought has dried up pastures across the state. Complicating matters is the Charco Redondo’s location in the heart of South Texas, a region notorious for sweltering heat and unpredictable rainfall. No rain means no grass, and without sufficient food for their herd, ranchers who rely on cattle for revenue must find an alternate source of income or a new livelihood. Rick and Carmen, too, have been affected. They’ve had to significantly reduce their heads of cattle, and the ones that remain graze on a rotational basis to help replenish the land. For years, the roundups were done entirely on horseback in an arduous game of man versus cattle. These days, Rick adheres to the more modern practice of using anything with a motor to gather a herd; it’s simply more efficient and much less hazardous. But he still uses horses to sort cattle once they’re confined in their pens — a nod to his family’s history and legacy. The long-term effects of a drought of this magnitude are unknown, but the Ramirezes accept the uncertainty. As gritty as it is wholesome, ranching is a fading lifestyle they hold dear. Nestled along the southern border of Duval County, the Charco Redondo Ranch is a 200-year-old piece of Texas history — a relic from the days before barbed wire and highways sliced through the landscape, ending the open range. Its origins date back to 1808 when four ranchero brothers — attracted to the lush pasturelands north of the Rio Grande — acquired a Spanish land grant of 22,147 acres. The brothers divided the property into quadrants, but to water their cattle, they shared a round, spring-fed tank, in Spanish called a charco redondo. That pond became the namesake of the Charco Redondo Ranch which, today, is a remnant of the area that was owned by one of those brothers, Don Simón Ramirez. Don Simón and his direct descendent, Rick, were raised on the same cowboy ideals: an appreciation for hard work and a respect for the earth. Rick’s childhood was spent in the pastures of the Charco Redondo assisting his father, Horacio. At an age when most children were just pretending to be cowboys, Rick was becoming the real thing — as comfortable in a saddle as he was on his own feet. By high school, Rick was foreman of the Charco Redondo’s summer hay-cutting operation. But unbeknownst to him at the time, Rick enjoyed a carefree childhood in the shadow of his father’s private struggle to keep the ranch in business. Struggle has pervaded the Charco Redondo story from early on. The Great Depression took a long-lasting toll on the business, and still reeling years later, Horacio’s mother (Rick’s grandmother) sold a 600-acre chunk of land while her son was serving in the Korean War. Determined to put the ranch back together upon returning, Horacio took out several loans to repurchase as much of the plot as he could. Then, ranchers everywhere were dealt severe blows. The 1950s saw one of the worst droughts on record, and in the 1960s, cattle prices plunged thanks to mega-sized feedlots and meatpackers streamlining the industry. By now, Horacio’s financial investment in the Charco Redondo outweighed the return, and he had a wife and six children to support. “It was a difficult time for our parents,” Rick said. By the late 1980s, Rick was a young dentist with a practice in San Antonio and was investing his own capital into the Charco Redondo. 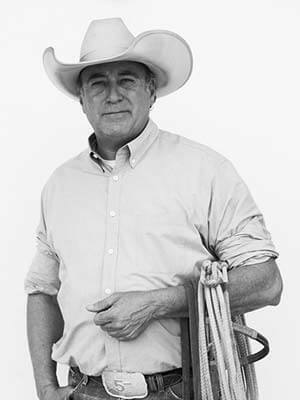 Twice, Rick saved the ranch from foreclosure on the courthouse steps. 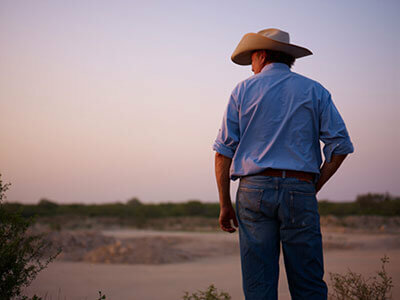 Horacio, aging and unable to maintain the workload the ranch required, convinced Rick to purchase the land in 1995. Rick’s wife, Carmen, recalls the bittersweet early years. The two met as undergraduates at St. Mary’s University in 1979 during Fiesta Oyster Bake. At the time, Rick was preparing for dental school, but in every free moment he helped his family run the ranch. It was clear that he and the Charco Redondo were a packaged deal, but Carmen said all it took was one smile. By the time their four daughters were born, Rick was engrossed in paying the Charco Redondo’s mortgage and turning it into a cash-flowing operation. Times were precarious — for a while, hand-me-down clothes and hot dog dinners were the norm in the Ramirez household. “It was really slim pickings, but he busted his rear and never gave up,” Carmen recalled. The trade-off was that the girls grew up in the tranquillity of open country. And even though Rick was spread thin working the ranch and supporting a full-time dental practice, he was fiercely committed to spending time with his daughters. On Nov. 3, 2011, the ranch reached a milestone. Standing front and center in the House Chamber of the Texas State Capitol alongside his mother, Rick was formally honored by the Texas Department of Agriculture with the Family Land Heritage Award for 200 consecutive years of operation by the same family. It’s a distinction shared by only eight other ranches in the state. Now the Charco Redondo is poised to be inherited by a seventh generation of Ramirezes. Two of Rick and Carmen’s daughters are interested in taking over the ranch. A cowboy’s two biggest enemies are Mother Nature and Father Time. Nowadays the pond that the ranchero brothers shared two centuries ago is nearly dried up. As for Rick, he imagines he’ll be on horseback for the next 10 years wishing it could last forever. On the rare occasions he complains of exhaustion, Carmen teases that he could have all the rest he’s ever wanted — if only he’d sell the ranch. His answer is quick.